Most of buildings nowadays are made of glass on 80% of their surface. If not so, they have quite a number of windows for light penetration, ventilation or even beauty and design. Cleaning these windows cannot actually be done manually. Window cleaning demands highly specialized personnel and machines for it to be perfectly done. Fast Cleaners Hammersmith Fulham is a firm which has specialized in window cleaning, offering the best services. We provide our professional services to commercial, residential and private homes. 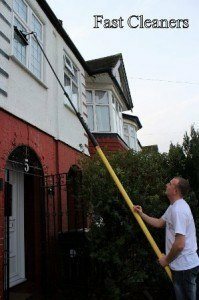 We have a range of modern machines and tools which enable us perform professional window cleaning service Hammersmith Fulham, whether to flats or houses. We are not afraid of heights because our skilled team can clean windows as high as your building is, comfortably and perfectly. In window cleaning, we use eco-friendly means. Pure clean water is exactly what we use with neither chemicals nor detergents. This is safe for human existence and environmental friendly as well. You may wonder how we do it using pure water and whether it really cleans. With help of special machines which have soft brushes, we clean all sorts of stains and dirt on your windows whether temporary or permanent. This may appear simple but it leaves your windows sparkling and glittering clean with no droplets stains or smears. In addition, we do clean window frames, gutters, doors and sills giving your building a polished and attractive look. We are flexible and available around the clock with minimal disturbance to clients’ activities. You can make your window gleam with minimal cost by choosing our cleaning company Hammersmith Fulham. For more information on our cleaning prices get in touch. Dial us on 020 3322 7168.